Do you want unique, modern and fresh logo for your business or website? I created more than 100 logos for different clients on different web portals. You won't be disappointed. I guarantee 100% satisfaction rate - LEVEL 3 SELLER. YOUR SATISFACTION OR 100% REFUND TO YOU - MONEY BACK GUARANTEE. 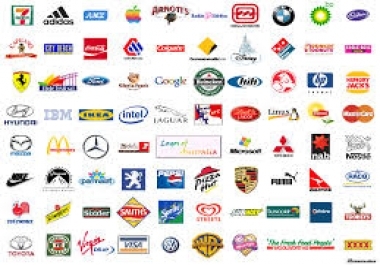 I have 100% positive feedback - this is the best feedback for logo design on SEOClerks among top sellng logo services. I can also create Facebook profile picture from logo and Facebook cover! Want to promote my service and earn money? Contact me and we will talk. My two samples (but I create much more) - you can send me also some examples and desires and I will build unique logo for you based on your needs. Always using latest trends for logo design. Do you need website? Contact me and order website and I will create logo for you for FREE. Why is so cheap, if is professional? Because is my hourly rate $5 and I can create very good logo in only one hour. Do you offer any logo edit, when you send first version of logo? Yes, I offer free logo changes, if you're not satisfied with it. What, if I will not be satifisied with logo? Don't worry, I will fixing/changing you logo until you will be satifisied. More than 100 happy customers (here and on other websites). Contact me - I'm sure you will like logo, created specially for you. You can't waste your money - money back guarantee provided! When not satisfied I provide full refund to my client.